Interactive and digital marketers are all about using Flash to engage consumers in their marketing campaigns. In the digital marketing handbook of 2010, it was reported that Flash would be the number one technology digital agencies and advertisers would be using much more of in 2010. However, Apple’s infamous Steve Jobs made a written statement this week with multiple reasons on why Apple’s mobile products will never support Flash. In Steve Job’s long open letter on flash , he lists and describes all the reason why Apple has decided not to support the technology on the iPad, iPhone, and iTouch. 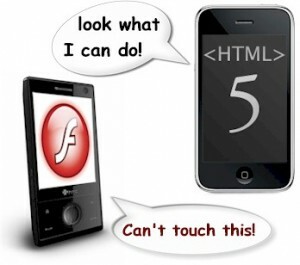 Apple promotes the use of HTML5 over flash. This basically means that new developers and new media agencies wanting to reach Apple users with interactive techniques will just have to learn to love HTML5. On the other hand and around the same time this week, Google’s Andy Rubin revealed that the upcoming version of the Android mobile operating system will fully support Flash technology. It looks as if the Android is more willing to play nice with developers. On the developer end of things, the differences between the two technologies is more apparent as Flash is largely covered with ActionScript and and HTML5 has new parsing rules and elements different from Flash. Which technology will work best to engage consumers is the question digital agencies are asking. For more articles on the evolving art of interactive marketing and social media optimization, visit The Social-Capitalist.